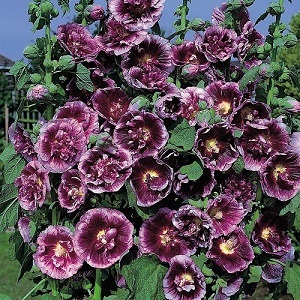 A wonderful blackcurrant-coloured Hollyhock, with tall spikes of single and double flowers in June to August. The flower stems grow to a sturdy 1.5-1.8m tall and are good for mid to late colour in the garden. They are very good border plants, tolerating drier conditions once established and they make good cut flowers. Hollyhocks prefer full sun and a well drained soil. Pack of 20 seeds. Sow in spring to autumn. Early spring sowings flower in the first year. Easy to grow. Sowing instructions and a colour photo are printed on the packet. See how your seeds are packed. Conditions Plant out in full sun and in well-drained soil. Sow in early spring for first year flowers and summer/autumn for next year flowers. Sow in cells or plugs of moist seed compost, cover with 5mm of compost or vermiculite and keep at 18 -20°C. Germination takes 1 to 2 weeks. Spray with a garden fungicide to prevent damping off of seedlings. Pot on when seedlings are well developed (be careful to prevent root damage), and protect summer/autumn sowings over the first winter in an unheated greenhouse. Water the plants during dry weather. The leaves and flowers of Hollyhocks die back in winter, when the dead material can be cut back. They regrow again in spring for another two to three years. Copyright © 2014 - Enter the copyright or legal information about your company here.